Pellpax Darren Kirk congratulates Huge Giveaway winner Peter on his prize. In March we announced our very first Huge Giveaway. A mammoth prize of nearly 60 different parts, including 3 airguns, lots of outdoor gear, archery equipment, and a break at an exclusive hotel! It’s a prize which is unprecedented in the industry, and one of the many reasons our customers love us. The competition ran for one month, and all you had to do to win, was to make a purchase of more than £25. For every additional £25 spent, a further entry was made. The great news is that we effectively received thousands entries during a 2 week period, thanks to the purchases made. And now it’s time to announce the winner! The lucky recipient of all that Pellpax goodness is Peter, a customer from Surrey. 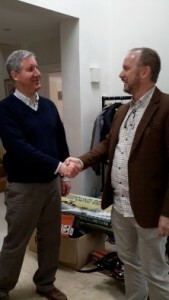 Our Director Darren Kirk went out in person to hand over the goods to the man himself (pictured).